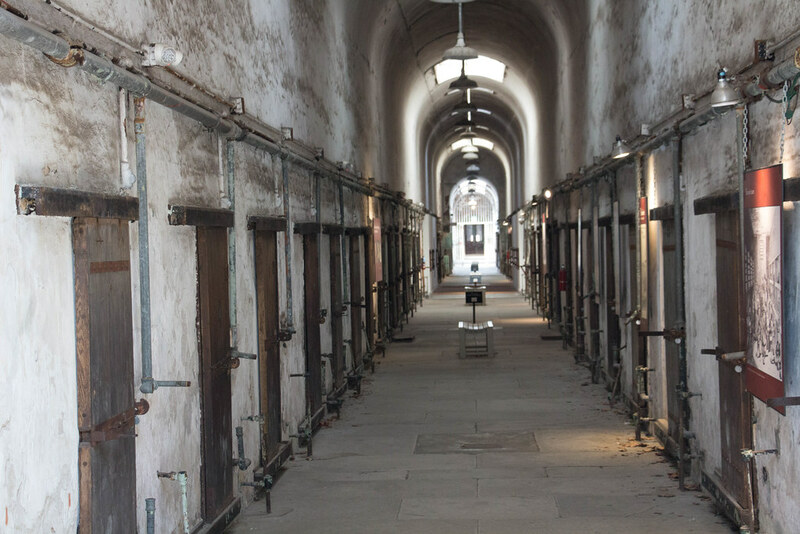 During a recent trip to Philadelphia, I spent a few hours at the Eastern State Penitentiary, an eerie place that encapsulates almost 150 years of the American philosophy of how to deal with criminals in our society. Read more about the facility’sÂ history on Wikipedia and see more of my pictures in this Flickr album. 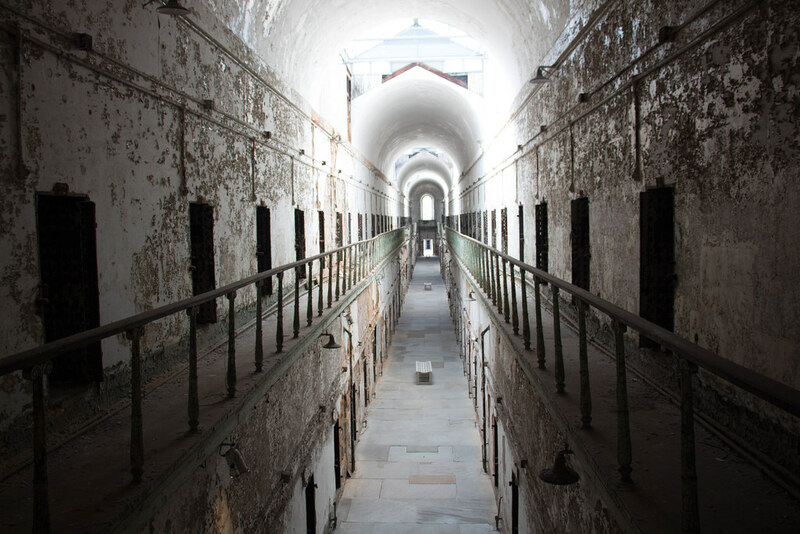 Cellblock one from the original building opened in 1827. Benjamin Franklin was part of the committee that designed the unique spoke and wheel layout that was adopted by many other nations in the 19th century. Each cell was designed to house one person in solitary confinement, giving them plenty of time to reflect on their lives. Later additions to the Penitentiary were two story buildings with cells now housing two people in pretty much the same space. 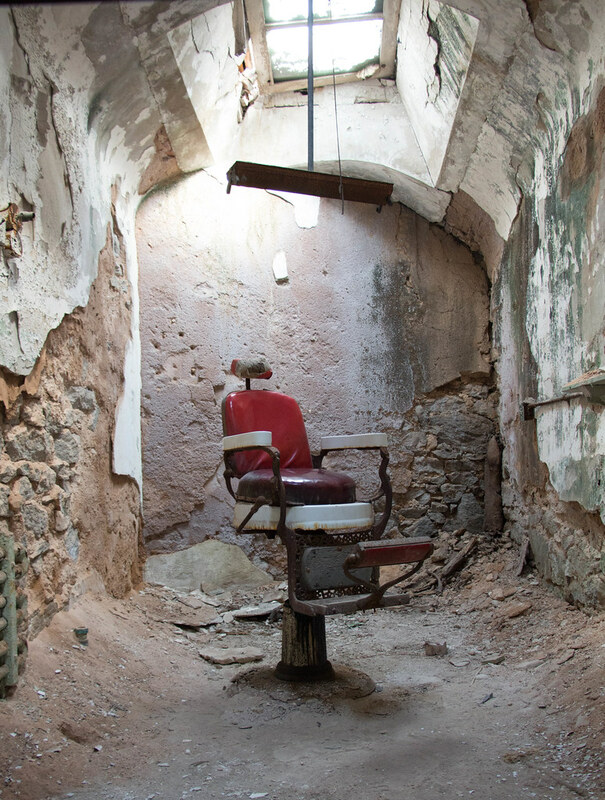 In it’s more recentÂ history, one cell of each block was set up as a barber shop, staffed by prisoners, with all inmates required to get regular haircuts and shaves. The red chair is an interesting contrast to the very brown and gray walls. 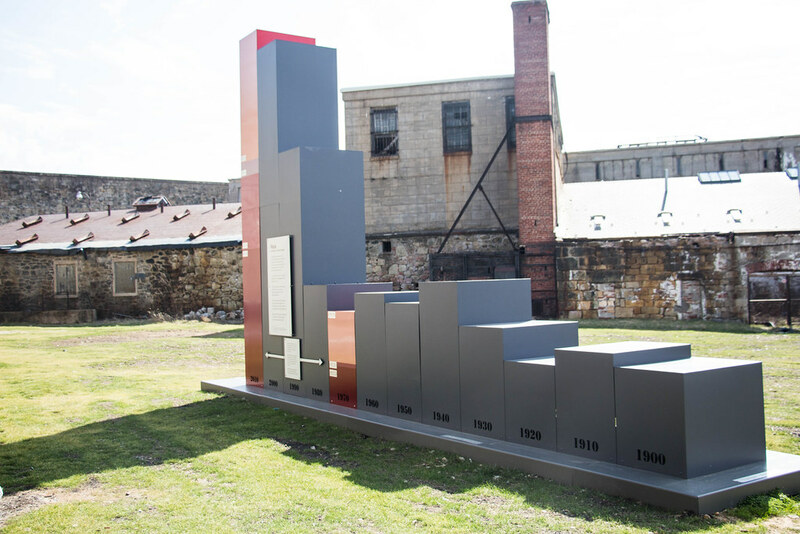 A display in the Penitentiary yard showing the number of people in imprisoned in the US by decade, along with other statistics of how our penal policies compare to other nations. Notice the huge population jumps since 1990, despite a decrease in crime rates. From the always hazardous intersection of education and politics, comes Reading, Writing, Ransacking, a summary of the systematic process to dismantle public education in Philadelphia and the state of Pennsylvania. There’s way too much good stuff in the column to quote without copying the whole thing, so take a few minutes to click through and read it. Just be prepared to yell at your screen. However, I can’t resist posting the final paragraph. I can think of stronger criminal metaphors than “burglarizing” but, ok, let’s go with that. It hardly seems possible but the fourth edition of EduCon starts on Friday and I’ve been looking through the conversations, trying to get a little organized before heading to Philadelphia for the weekend. It’s hopeless. There are just too many good sessions on the schedule and I’ve got at least two tagged in each block. Â But that speaks to the unique nature of this conference. EduCon is relatively small meeting, capped at 500 participants, with no big vendor displays andÂ a focus on conversations about changing education led by some incredibly interesting people. Which means all of us in the sessions, very often including the SLA students running the cameras, have the opportunity to be an active part of each presentation, not just a passive member of an audience. Anyway, when you put all the pieces together, it makes for a great few days of connecting and learning from both people I regularly follow than those I have yet to meet. If you can’t be there in person, follow along virtually. Â I think the discussions will be streamed through the Elluminate rooms linked on the Conversations pages. Plus all the tweets, blog posts, photos, videos, and whatever else people use to share their learning. And hopefully the snow can take a break long enough for me trek up 95 and back.